Before you begin, you must decide where your command center will be located and how much space you have available. If the command center is hidden in an out-of-the-way spot, it will probably not be as useful as you had hoped. Some of the most popular spots are in the kitchen or near the entrance the family uses most often. You want to make sure you select a spot that will be convenient to use for the entire family. You must also first determine how much space you have available. You can design an amazing command center, but if you do not have the space for it, all of that effort will be wasted. For the layout of our home, placing the command center in the hallway leading to the garage works best. This is the exit our family uses almost exclusively. This location will allow easy access as we are walking out the door and coming back in. This hallway is also quite long, so I can have a large command center – which is great. As you see below, there’s a lot I want to accomplish with this command center, so the large space is needed. There are many ways to determine your top issues. To help me decide what I needed most in this command center I didn’t put away anything that my family dropped in the hallway or on the kitchen counters for a few days. My goal was to do this for a week. I didn’t make it. Along with the above, I know that I need a place to keep track of our ever-changing and super-busy schedules and this week’s dinner menu. 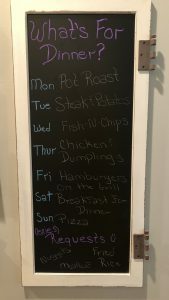 To see how I created our weekly dinner menu board, please click here. To add a little fun to the command center, I turned an empty picture frame into a grocery list board. 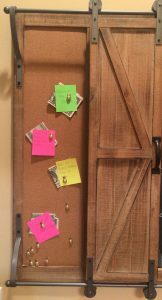 Family members can use the liquid chalk markers, which are stored in these cute little bins which have been attached to the wall with Command Adhesive, to add to the grocery list. Then on my way out the door to the grocery, I simply snap a photo of the grocery list with my phone and I’m all set. I have tried many other options for shopping lists, I even came up with an idea for an iPhone app for creating shopping lists, but the best options I have found so far is this. After all, who wouldn’t want to write on a glass board with a liquid chalk marker? I use this super trendy picture frame for our shopping list and I love that it has two sections. I can use one side for groceries and the other side for non-grocery shopping I need to do. Hummm. Maybe the second side should always say, “Homegoods”. 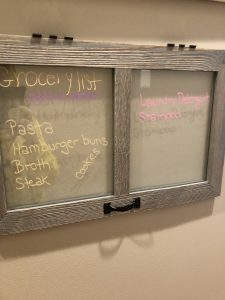 Empty picture frame used in Command Center for shopping list. I still need to work on creating a grocery request list, and I have something special in mind for that. Check back soon as I will post my new grocery request list as soon as I have it completed. Whew. That’s a huge list. But looking over it, I think it’s doable. There are two ways to approach the next step. You can plan it all out on paper and begin shopping with a list of exactly what you want and need. Or you can choose a more flexible approach and begin by taking care of 2 or 3 of your most urgent needs first and re-evaluate after you start small. I took the second approach and began looking for pieces to help eliminate mail and receipts from my kitchen counters. I also wanted a way to contain my reusable shopping bags as they tend to get dropped on the bench near the garage door. 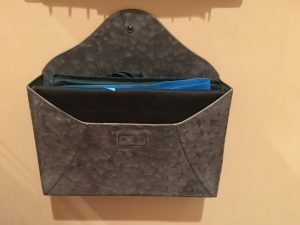 To eliminate mail, I wanted a bin for each family member, as well as an “unsorted” mail bin where we could just toss the mail on the way in the door if there was no time to sort it into individual bins. I found these hanging bins that seemed perfect for sorting mail. I also found this which is just the right size for my “unsorted mail”, and the smaller solid container is perfect for receipts. As a bonus, the second small container can hold my husband’s glasses – score! For my reusable shopping bags I found this cute little metal envelope that is just the right size. 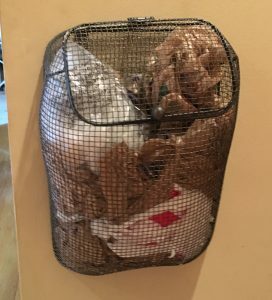 And an item I found that I didn’t even realize I needed is this cute little farm basket which I have stocked full of plastic grocery bags waiting by the door to be returned to the grocery for recycling. I still have several items on my list. I know I need a bench for changing shoes, storage for frequently used shoes, and hooks for backpacks, jackets, and purses. As I find the perfect items, I will update this blog. After going through 17 shades of gray looking for the perfect color for our master bed and bath, I’m not looking forward to selecting a paint color for the long hallway that leads to our garage. However this project may just give me the inspiration I need to tackle choosing a paint color again! OK, to be honest I do not love to paint. Actually I really dislike painting. But I love the look of a freshly painted walls, and this back hallway really needs it. This is the most used entrance to our home and the long, cold winter has taken it’s toll. I know I really am going to paint. I’m just putting it off for a couple of reasons. First, I want to make sure I like my placement of all my items in my command center. It will be much more pleasant to patch any holes that might exist due to rearranging the command center after seeing how it works in practice that it would be to patch a hole in a freshly painted wall. And second, I want to see what finishes I choose for my accent items before I choose a paint color. I know I can easily get any color or shade of paint desired, but finding the perfect items for my command center in the perfect shade won’t be as easy. I also realize that I will end up painting or staining some of my command center finds. I know that I won’t be able to find all of the things I need in the exact color I need them. And while I really dislike painting walls, I don’t feel the same about painting or staining furniture and accessories. I knew I wanted something over the door with some type of message reminding family they are loved each time they leave the house but I wasn’t sure exactly what I wanted. I had in mind something that says to be safe, have fun, and come home, though much more elegantly than that. For directions on how to make this, please click here. I strongly suggest saving the decorative accents for last so that they don’t end up taking up valuable space you needed for something functional. And with my Life and Love sign, I totally broke that suggestion. It was one of the first things I added to my space. But, in my defense, I placed it above the door to the garage and nothing functional was going in that space as I would need a ladder to reach it. To see the completed family planning side of my hallway command center, please click here.